If there's one consensus view about the 2012 presidential race, it's that President Obama's re-election chances will hinge greatly on whether the state of the economy -- and just as importantly, voters' perception of the economy -- improves. Therefore, it was considered a blow to Democrats that the latest federal jobs report, released this week, showed sluggish growth: just 80,000 jobs added, for a third straight month of slow hiring. Despite a few good signs, the overall picture was bleak -- offering, in the Associated Press' words, "a new chance for [Mitt] Romney to seize momentum." That already seems to have happened, at least with some voters: A new poll shows 49 percent of those surveyed believing Romney could "do a better job handling the economy," compared to Obama's 44 percent (although Obama leads when the question is who "understands" the economic problems facing the country). But there was an interesting detail in the latest jobs report: Many of the states that have seen the biggest job gains over the last year are in the South -- including many states that pundits have written off as impossible, or at least a big challenge, for Obama to win in November. The list of the 19 states with the biggest decrease in unemployment is diverse: Some are run by Democrats, some run by Republicans, others -- such as North Carolina -- have split leadership. Some, like Nevada, have been climbing down from record unemployment figures (13.7 jobless rate in 2011 to 11.6 in 2012); Oklahama merely saw a decline in its already-low numbers (5.9 to 4.8). But the list does show a regional bias: Eight of the 19 states with the fastest-falling unemployment rates are in the South. 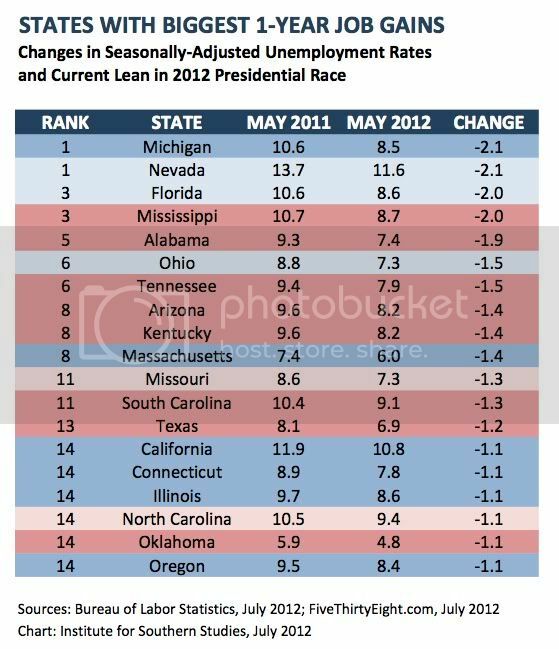 Yet Obama may gain little political traction from the improving economy in these states. As The New York Times' poll-tracking site FiveThirtyEight shows, in all but one -- Florida -- the polls currently show them falling into Mitt Romney's camp. Clearly, the economic news is still grim and hitting some communities particularly hard. For example, new data on the urban African-American unemployment rate shows joblessness over 17 percent in places like Charlotte, N.C. The ratio of those seeking jobs to the number of jobs available is 3.5 to 1. There are clearly some signs of progress. But what's less clear is whether that will affect Obama's ability to win Electoral College votes in Southern states.